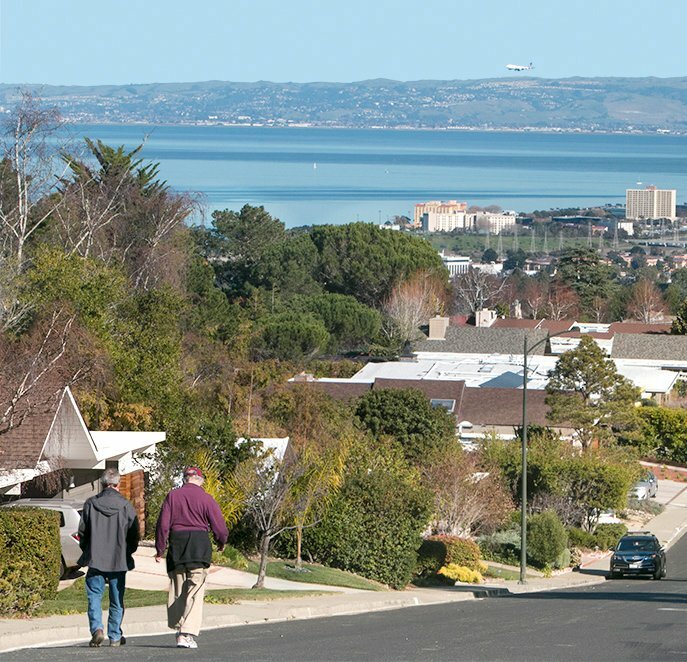 The streets of Burlingame's Mills Estates are steep and not altogether conducive to strolling, but some neighbors (as above) welcome the challenge. 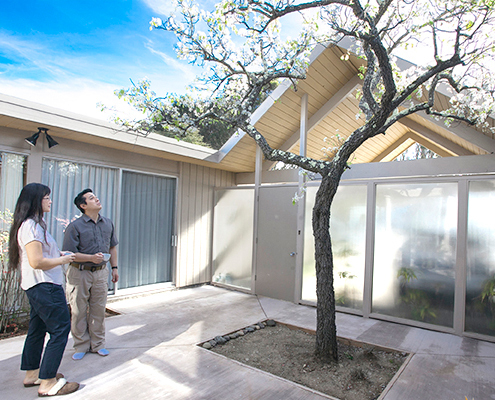 Kendall and Angela Chong in their atrium, admiring their tree's spring blossoms. Talk to folks who live in Burlingame's Eichler homes, arrayed on a steep hillside with breathtaking views of, among other things, San Francisco International Airport, and you'll hear about parties. Flynn Livingston describes a 'formal' she threw a few years back with 80 people in her custom Claude Oakland-designed home, "and we weren't full." One hundred helium balloons filled the volume with their hanging streamers. Randy Danielian, who grew up in the same Mills Estates neighborhood, remembers pool parties in her backyard, a magical place complete with a burbling circular fountain, and Fourth of July fireworks set off every year by a neighbor. Jackie Gray remembers parties her next-door neighbor used to throw, often with live music. "Great fun," she says. And folks talk about how friendly and helpful their neighbors have been. Gray recalls what one neighbor told her, after he helped her successfully fight City Hall on a preservation issue. "He said, 'We're not in each others' kitchens [chatting], but as neighbors, we're there for each other." Sometimes neighbors have been there rather unexpectedly, like the time one of them showed up at the home of Donald and Sora Lei Newman pushing a cement mixer. "He said, 'I'm tired of hearing you talk about building your pond every day. We're going to do it today,'" Donald recalls. The Newmans have enjoyed that atrium pond ever since, and that was 50 years ago. Today it's home to carp and four basking turtles. Residents also talk about the many old-timers who still live in homes they bought new in 1963 and 1964 for $45,000 or so, and about newcomers who are buying the homes for $1.8 million, occasionally more, and refurbishing them. "There are constantly contractors in the neighborhood renovating the houses," says Byron Lee, a San Francisco cardiologist who migrated south eight years ago in search of more room and better schools for his young family.